TV5 has announced that it will give away a combined total of 20 Million Pesos in the biggest and most intensive artista search ever mounted on Philippine Television: ARTISTA ACADEMY. The search will kick off with a massive one-time grand auditions at the Smart Araneta Coliseum on June 19, 2012,Tuesday. Thru ARTISTA ACADEMY, TV5 goes all-out in discovering and developing Philippine Television's biggest new stars, by offering real training in a legitimate school of television arts along with the fame, fortune and stardom every showbiz hopeful dreams of. 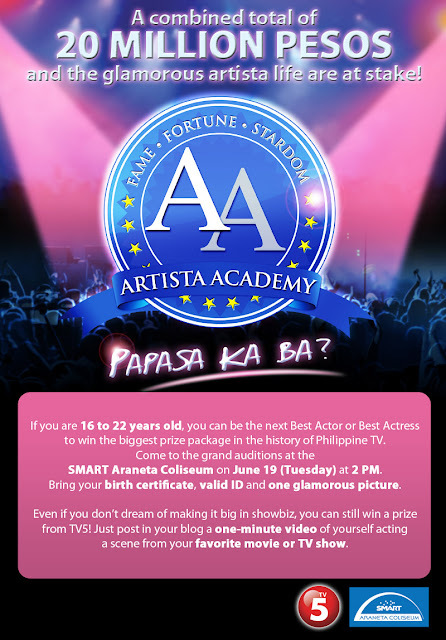 ARTISTA ACADEMY searches for young showbiz aspirants aged 16-21 who have the looks, charm, potential and determination to go through extensive curriculum-based training under the Asian Academy of Television Arts (AATA) to become certified professional actors armed with the acting versatility and right attitude to make a name for themselves in the industry. Over P20 Million in total prizes will be given to the deserving winners who will be hailed as ARTISTA ACADEMY’s Best Actor and Best Actress. Not only will they be equipped with the proper acting training from AATA to become TV5’s next big stars, they will also be the richest of all winners in the history of all talent searches in the Philippines. All 16 finalists who will be chosen as ARTISTA ACADEMY Students will be granted full AATA scholarships and the chance to undergo comprehensive training with the best in the industry – including multi-awarded director Joel Lamangan, music master Louie Ocampo, dance guru Georcelle Dapat of G Force, along with other esteemed TV professionals and distinguished celebrities. Acclaimed Film and TV director Mac Alejandre heads the TV5 TALENT CENTER and will be working with the Head of AATA, well-known Entertainment executive Wilma Galvante, who will act as Principal of ARTISTA ACADEMY. “We are all excited with the launch of Artista Academy because this really tops all artista searches that have been done in the country. We are offering real training in a real academy for our future stars. No other program has offered such school-based learning and development from an academy of television arts. And, of course, it will be a real life-changing experience for not just one but two students because we are giving away P20 Million worth of prizes, including lead roles in a forthcoming teleserye of the network. This is real fame, fortune, and stardom. This is as real as it can get,” shared TV5 Creative and Entertainment Production Head Perci Intalan. All interested artista aspirants aged 16-21 are invited to come to the ARTISTA ACADEMY grand auditions at the SMART Araneta Coliseum on June 19 at 2pm. By bringing a copy of their birth certificate, valid ID, and their best glam pictures, they are a step closer to living the glamorous artista life. It's truly very complicated in this busy life to listen news on Television, therefore I simply use web for that reason, and get the most recent news.